If you’ve always envisioned living in a house where a computerized voice fulfills your every want or whim, then the future is here. Today’s technology is finally making life a little easier in the one place we need it, our homes. We’ve put together a list of easy DIY updates you can do around your abode to bring it into the 21st century. 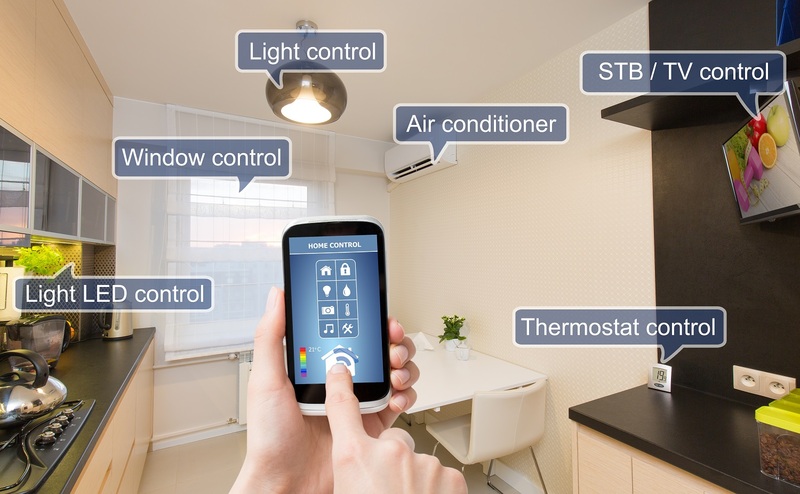 Smart Thermostat – They are as easy to install as the old thermostats and the control screens walk you through the set up. Doorbell with Motion Sensor – Automatically know when a person is at your door and respond to them with your phone. Accent Lighting – Some systems work with existing lamps and allow you to program them to shut on and off via your smartphone. You can also adjust brightness and color. Irrigation Controller – You are no longer at the mercy of an old-fashioned timer, you can now use an app to control when the system runs and change it with weather conditions. Garage Door Opener – Motion sensors automatically turn on lights and a timer will put the door down if you forget. Security System – Most offer cameras and motion sensors. Decide if you want to monitor the system on your phone or have professional monitoring. Home Electricity Monitor – This wireless device attaches to your breaker box and gives real time stats on your home’s energy usage. Smoke & CO2 Detectors – They look like the old versions but these notify you on your phone if there is a problem. Outdoor Lighting – Individual light fixtures now come with wireless features and an app to set timers from any device. Electrical Outlets – These wireless plug-in devices allow you to control everything from the coffee maker to the TV from your phone. Some come with UPS outlets for charging that very busy smart phone of yours. Wireless devices can make life easier and save money but too many can be chaotic. Consider buying devices that work off a computerized voice controlled hub like the Amazon Echo or Google Home. These systems allow you to add on individual gadgets instead of buying single devices that you must control through multiple apps. Though it may not be high tech, consider upgrading your home’s basic electrical system. Every year over 51,000 residential fires are caused by electrical malfunctions. Install Arc Fault Circuit Interruption Outlets (AFCI), which shut off when an electrical arc or discharge is detected. If you aren’t prepared to tackle electrical DIY jobs, do the prep work like running cables and installing wall boxes. Bring in a professional electrician to do the final power hook-ups and to make sure you are up to code. Modernizing your house is always a wise move. Advancements in technology can help make your home safer and more efficient. One last gizmo to mention may end many arguments around your house – it’s the motion-sensor toilet seat light. It lets you know the status of the seat with different colored night lights. Now that’s a device we can all get behind. Isn’t technology great?! Our expert staff is always on hand to help find the right equipment for your next DIY home update. Looking to address some outdoor lighting issues? You can find plenty of handy DIY tips in our blog, 9 Easy Steps to Keep Outdoor Lighting Bright. As always, if you have any questions about what to choose, pricing or how-to’s, don’t hesitate to contact us. Stop by our store — we’re open seven days a week.